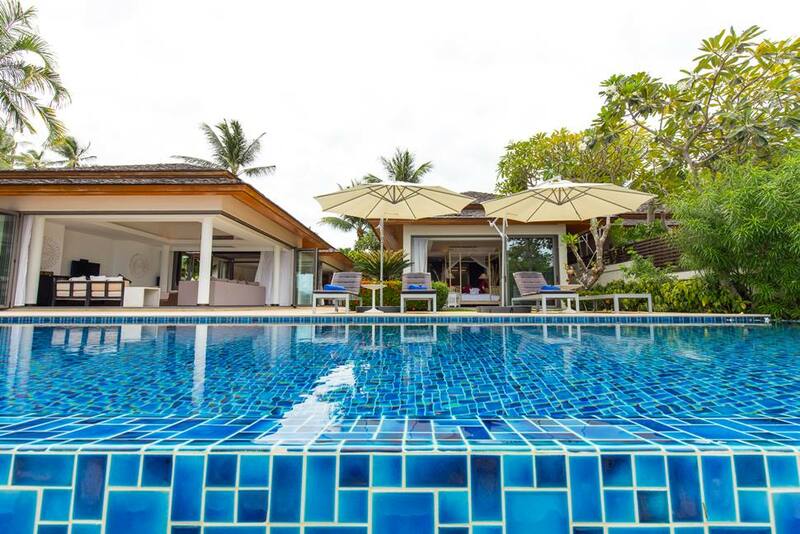 "Style and sophistication come as standard"
Baan Ban Buri, an exclusive beachfront villa located within in the prestigious Dhevatara Residence. 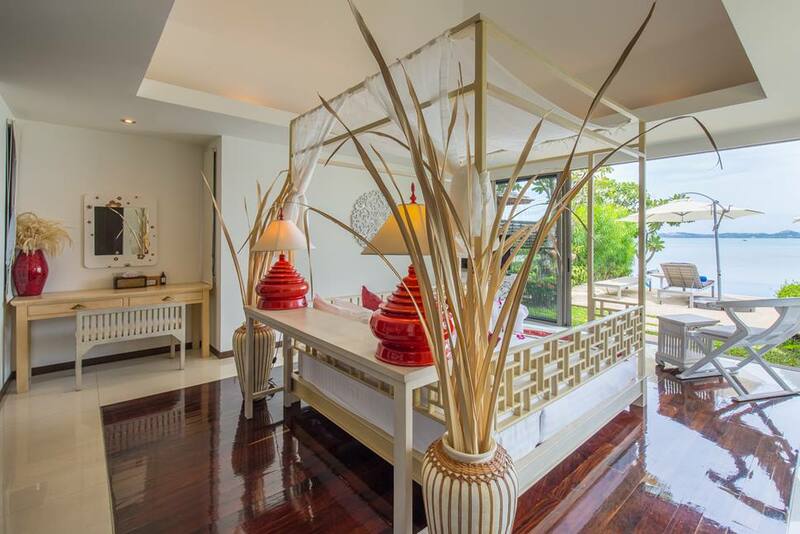 This remarkable property expertly incorporates everything required for a luxury holiday experience. 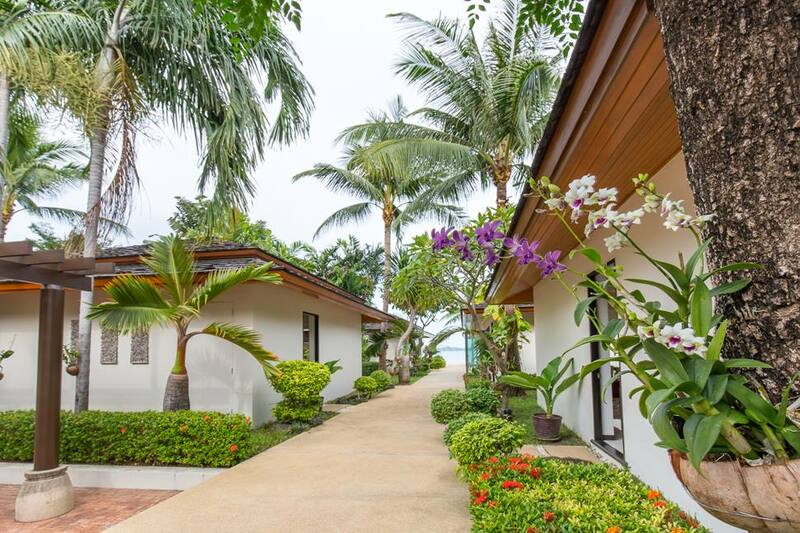 The private road, with its exquisitely manicured and maintained tropical planting, leads through Dhevatara Residence and up to the private gated entrance to Baan Ban Buri. 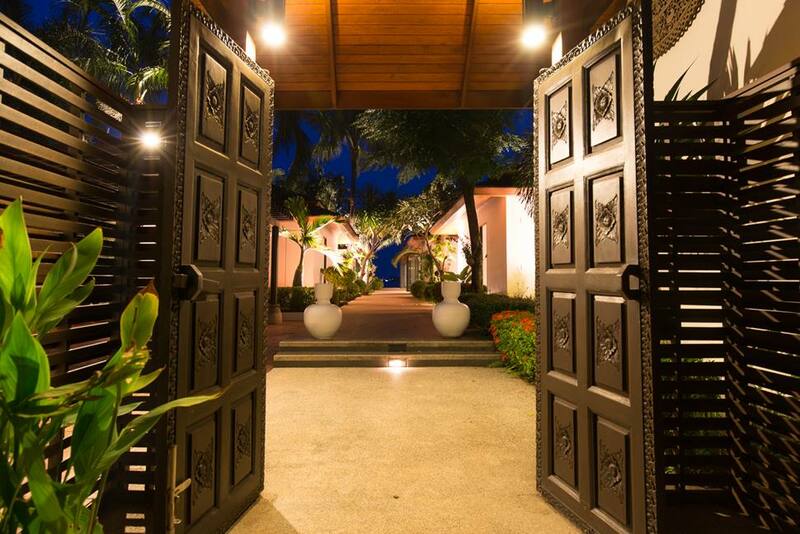 The imposing wooden gated entrance gives indication of the quality and style within. To the left of the walking entrance is a large, equally impressive, gateway leading into the parking area. 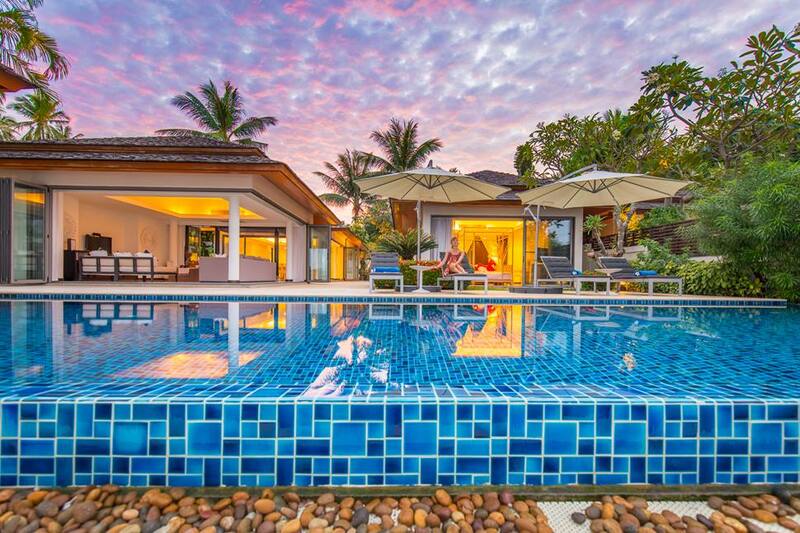 Once inside the view through the center of the property directs you beyond the buildings, the infinity pool and the grounds of the property straight to the ocean beyond. This is a first impression that has an immediate impact and dominates your attention. 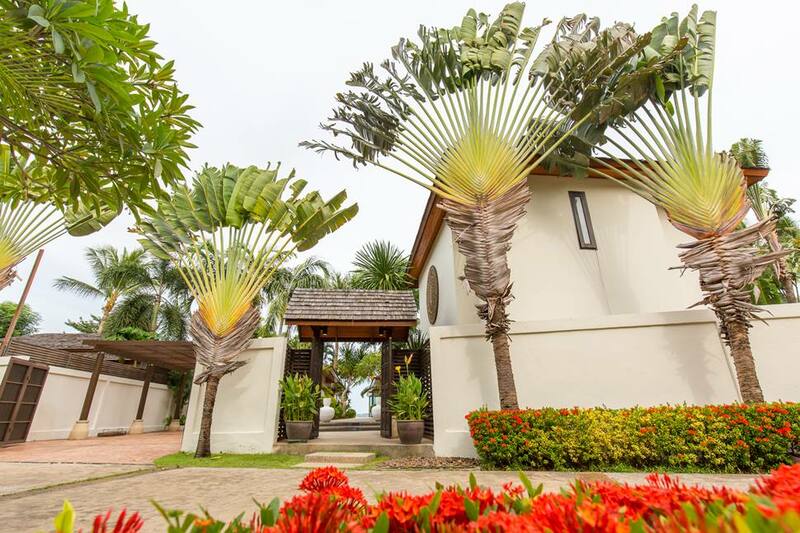 When your senses have adjusted to the view, you’ll be equally as impressed with the style and layout of each of the stunning pavilions which make up this spectacular property. 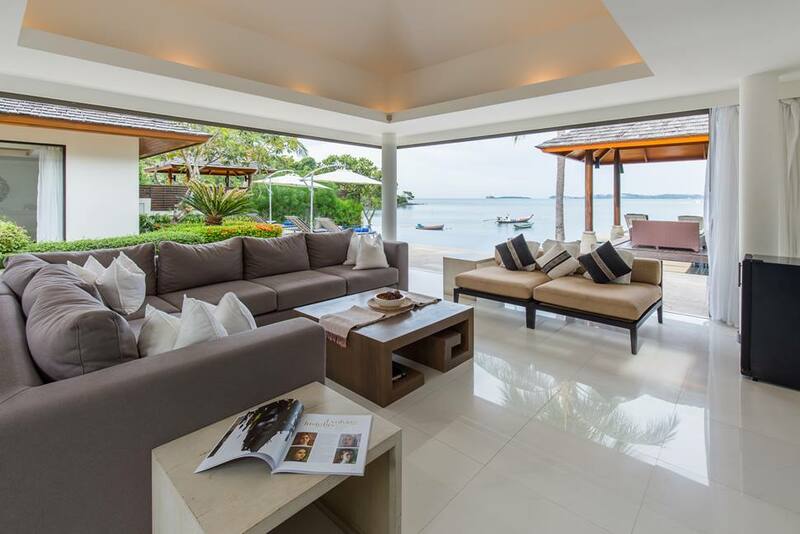 Six separate pavilions are situated on either side of the central pathway, incorporating four bedrooms, a large open-plan dining area and kitchen and a sensational lounge. 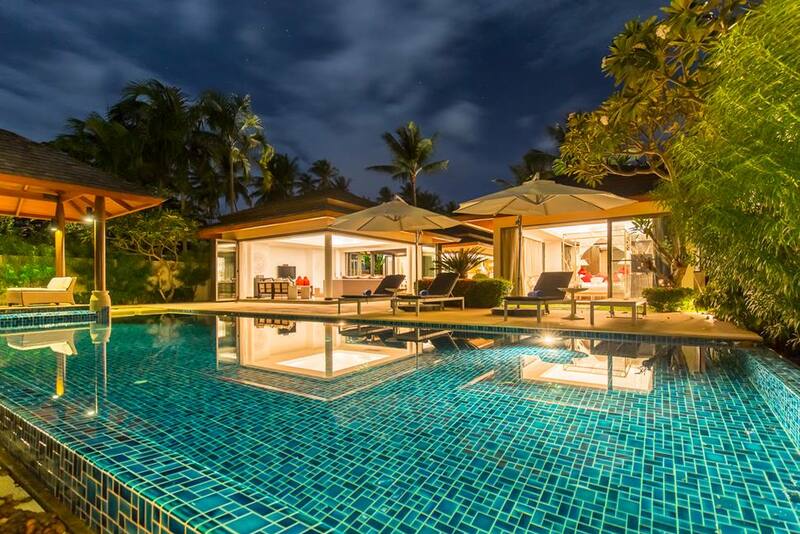 A poolside sala, infinity pool and private beach entrance complete what is one of Samui’s premier beachfront properties. 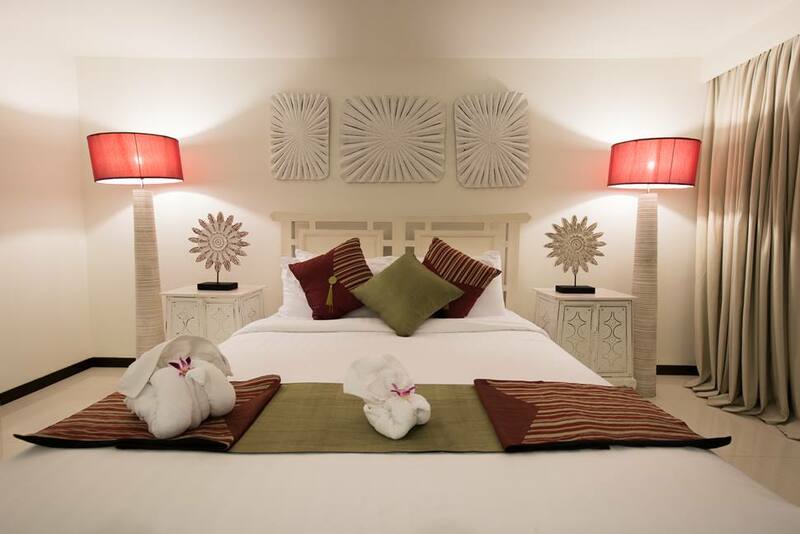 The first pavilion on the right as you enter is an en-suite double room. 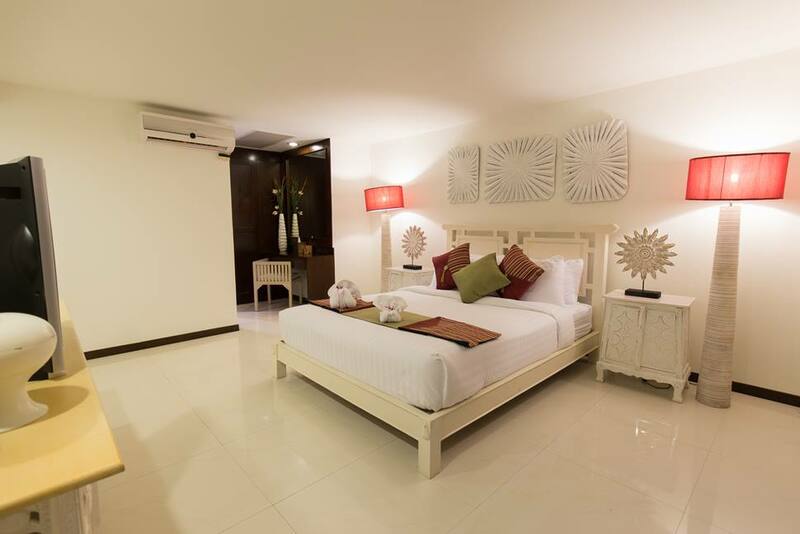 In here you’ll find a room where the overall theme is white, with white wooden bed, ornate white cabinets and contemporary white wooden artworks. However this room is a wash with colour and animation with the clever use of bright red accessories such as lamp shades, throws and cushions and even red detailing added to some of the white artworks. There’s a TV. 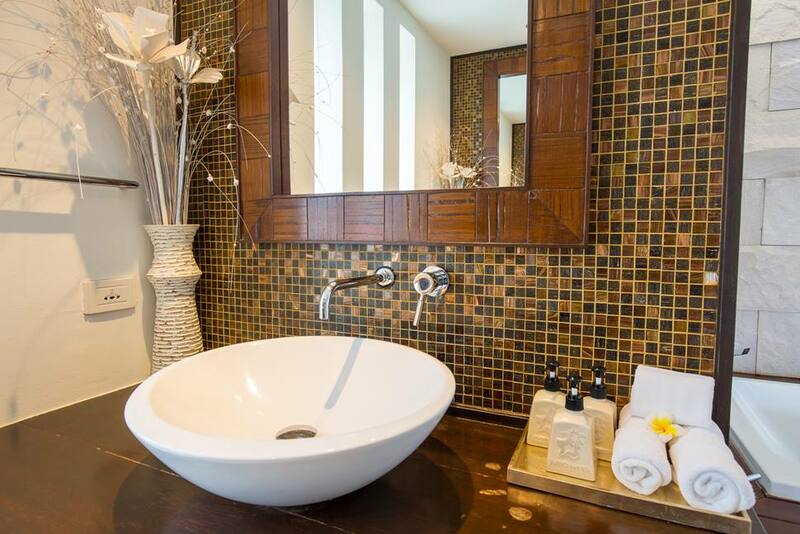 A dressing area and a stylish en-suite shower room complete with walk-in shower and mosaic tiling. 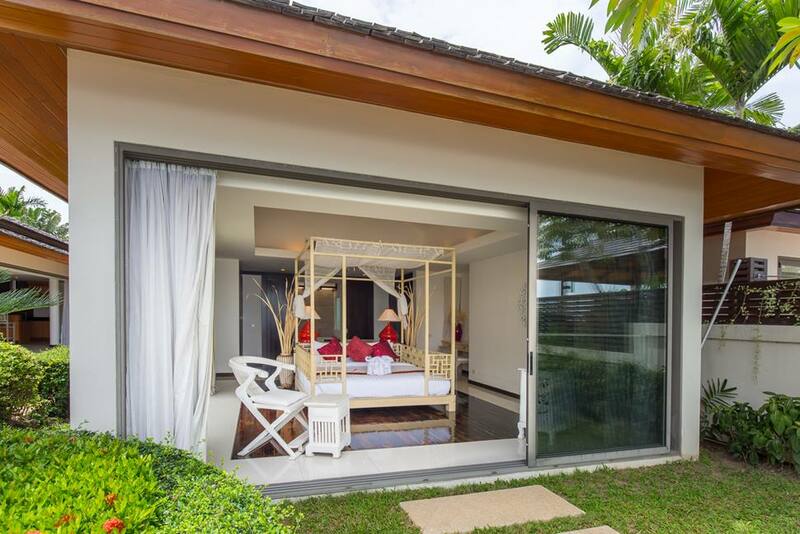 A well planted garden separates this pavilion form the next which follows a similar themed décor or white and red. 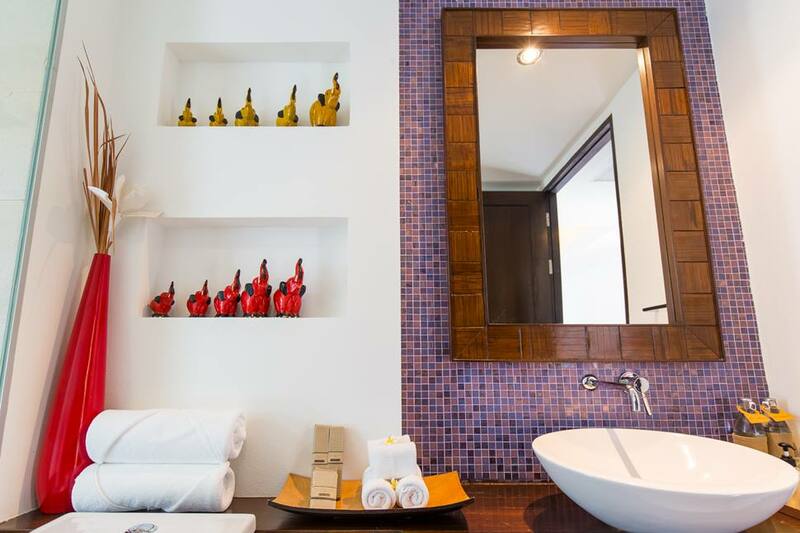 In here the wall-mounted artwork is also contemporary, yet the design lends a certain authentic more traditional appeal. The TV sits next to a collection of modern wooden elephant ornaments on a very ornately carved white wooden cabinet. 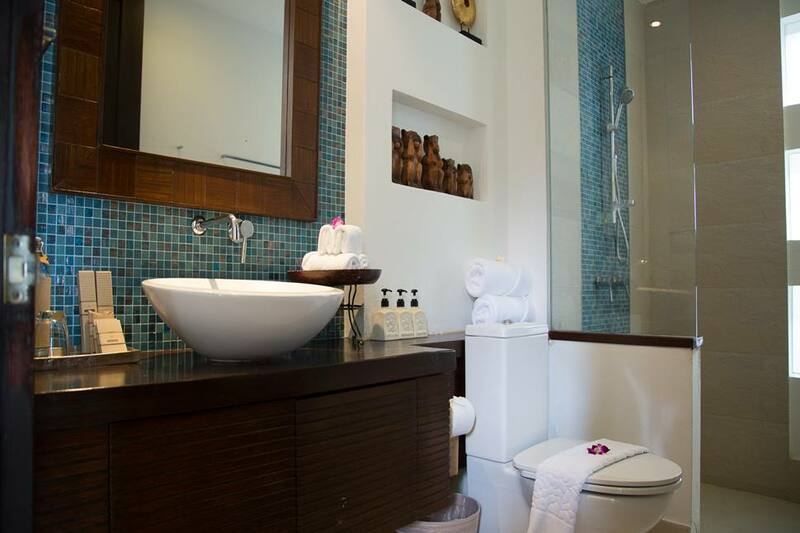 There are twin beds in this room, a dressing area and an en-suite shower room with walk-in shower and mosaic tiling. The next pavilion on the right is the heart of the property where guests will come together to share their holiday experience. A large, extremely well fitted western kitchen is separated from the dining area by a central island feature and breakfast bar. Rich wooden units and a brick splash back area provide a comfortable homely feel to this area and black polished work surfaces together with high-end appliances keep this space modern and practical for the needs of the guests. 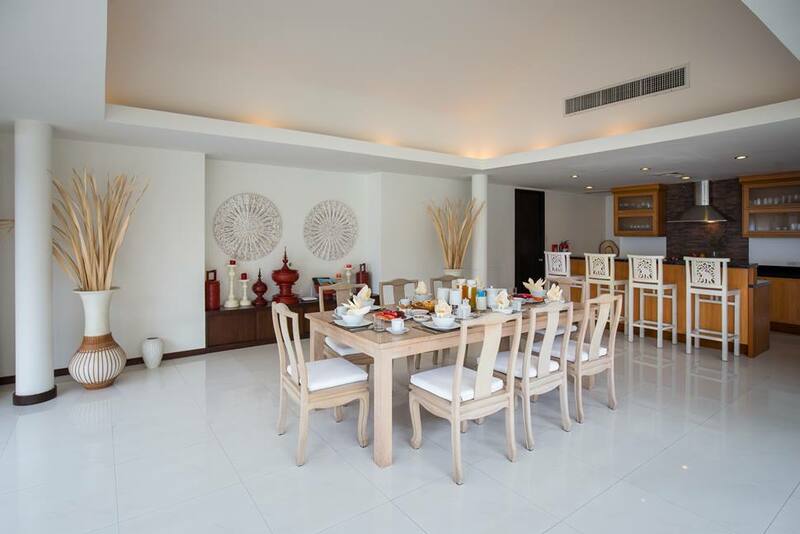 A majestic limed wooden dining table dominates the dining area with some beautifully used accessories to make this space a pleasure to relax and enjoy a snack or for a more formal dining experience. 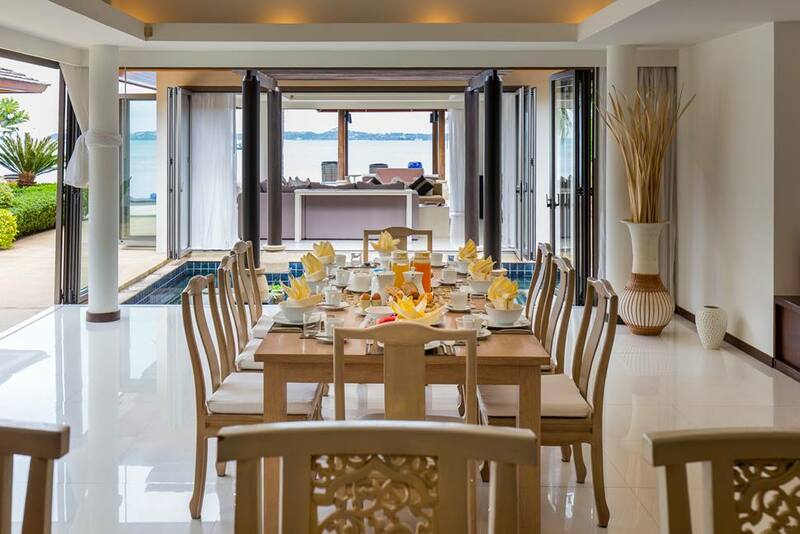 Once again white wooden carvings are evident with chairs, the centre of the dining table and the contemporary artworks all sharing this theme. 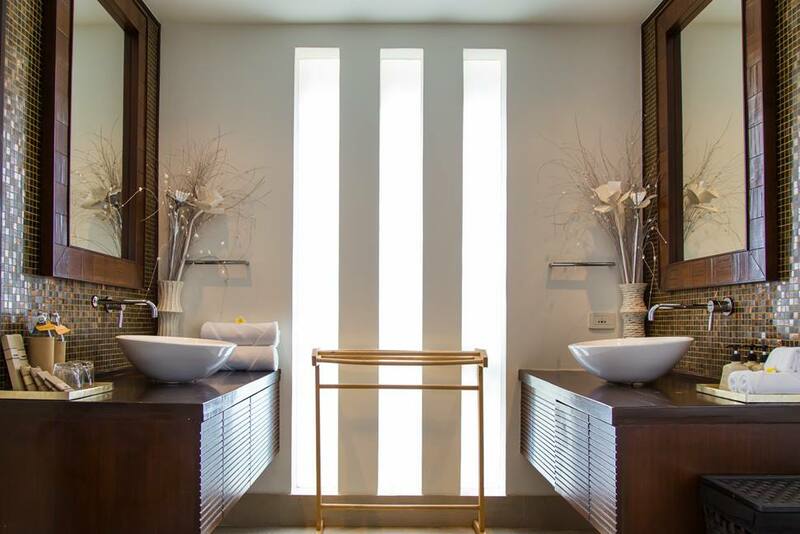 In here the use of more traditional ornaments and Thai artifacts completes the ensemble. 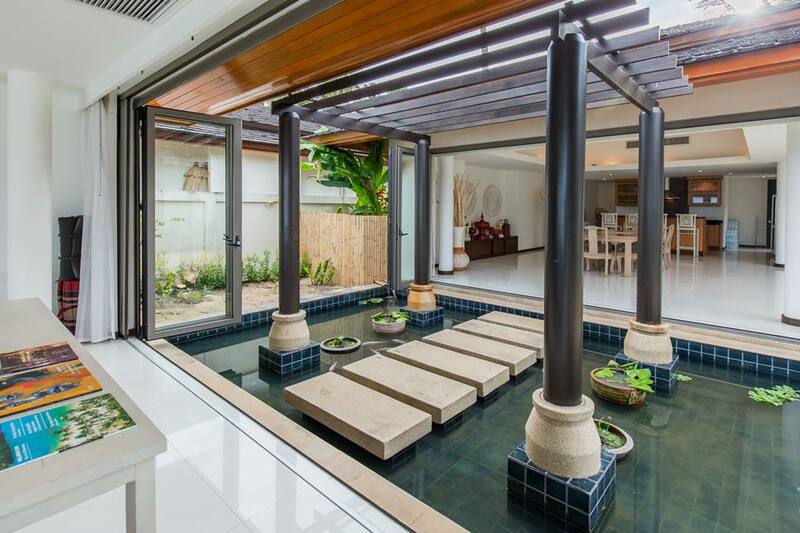 Stepping stones lead over a fish pond and kink this room with lounge. 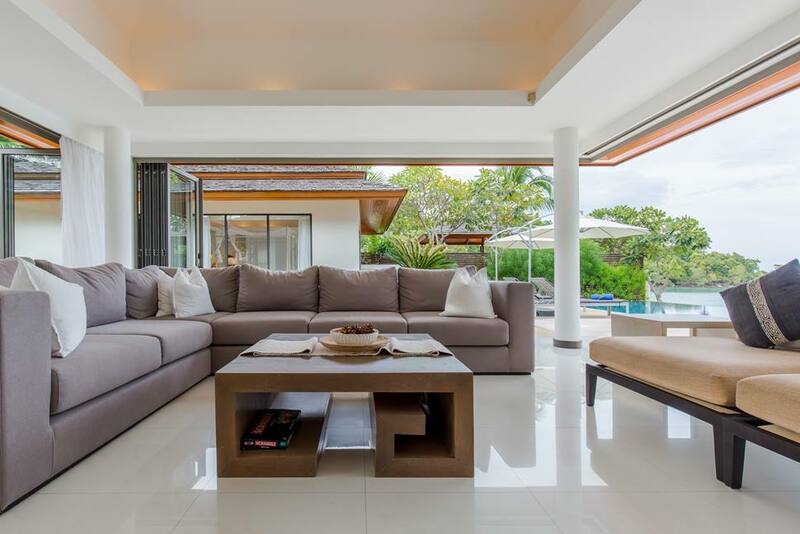 Doors open completely around two sides of this room giving a wall-less feeling and epitomizes the sought after indoor/outdoor lifestyle which is only possible in such a tropical climate. 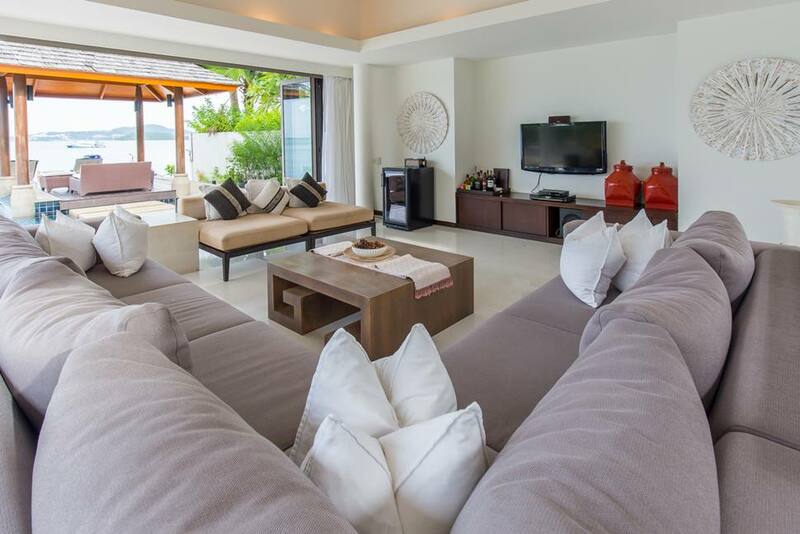 Furnished with very comfortable sofas arrange to encourage conversation, this is a very social space. The wall mounted TV provides an alternative form of entertainment when required. From the light and airy ambiance of this room you step onto the pool terrace where more stepping stones lead you across the pool to the covered sala. An ideal place to sit, relax and simply enjoy the view. 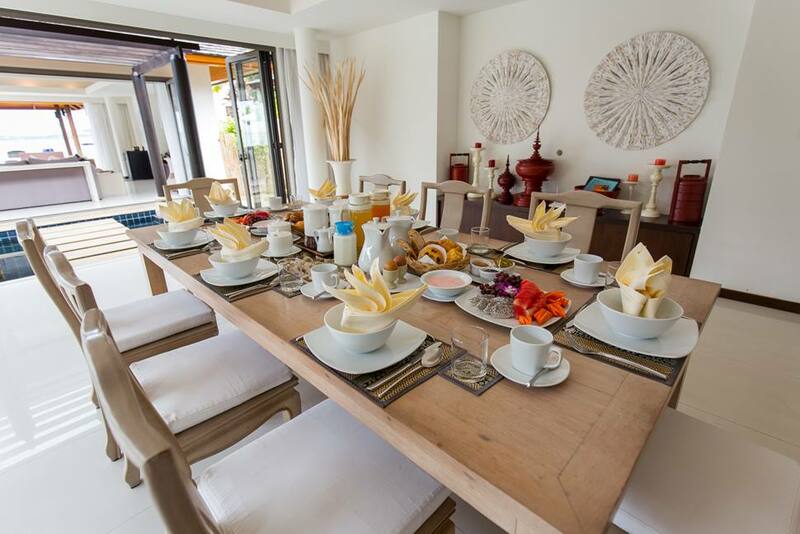 It is also an exceptional place to dine during the day or night. 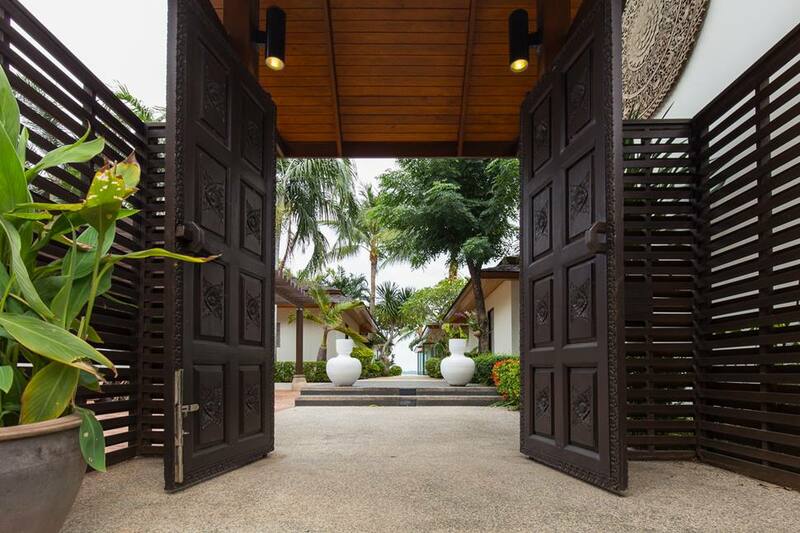 To the right of the sala is an outdoor shower and steps leading down to the private gated entrance onto Bophut beach. 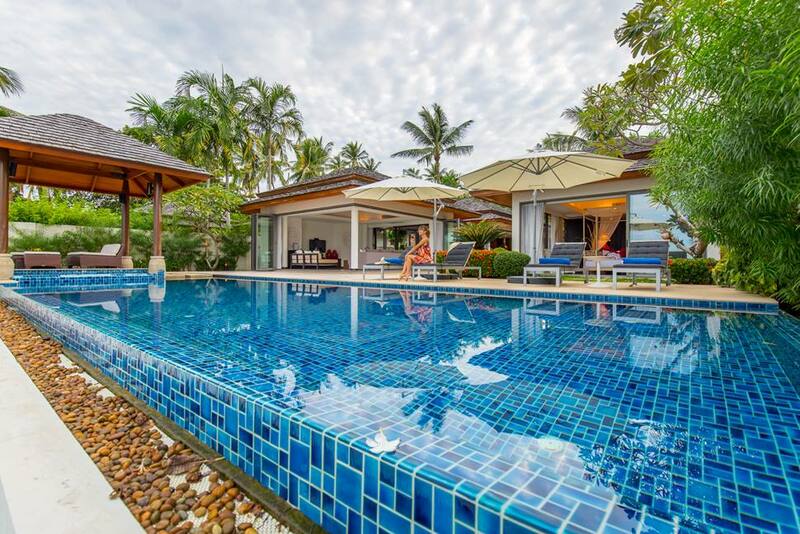 To the left the blue-tiled infinity swimming pool fills the width of the property. 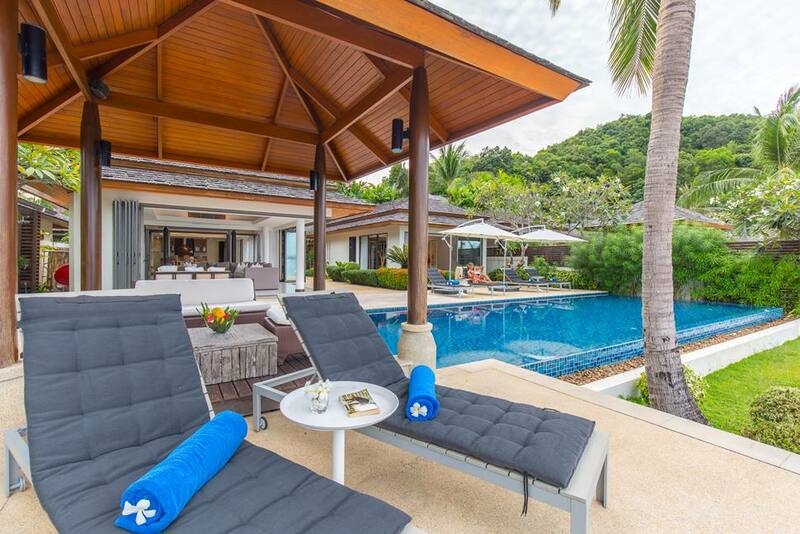 There’s a good sized pool terrace ideal for soaking up the Samui sun. Heading back down the other side of the central pathway you come to the master suite which opens directly onto the pool terrace. 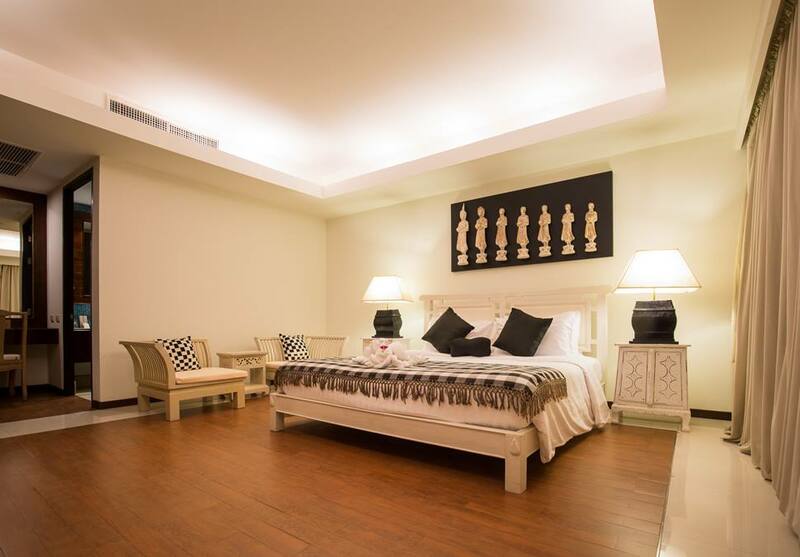 Rich dark-wooden floors are contrasted once again with white walls and white wooden furniture. 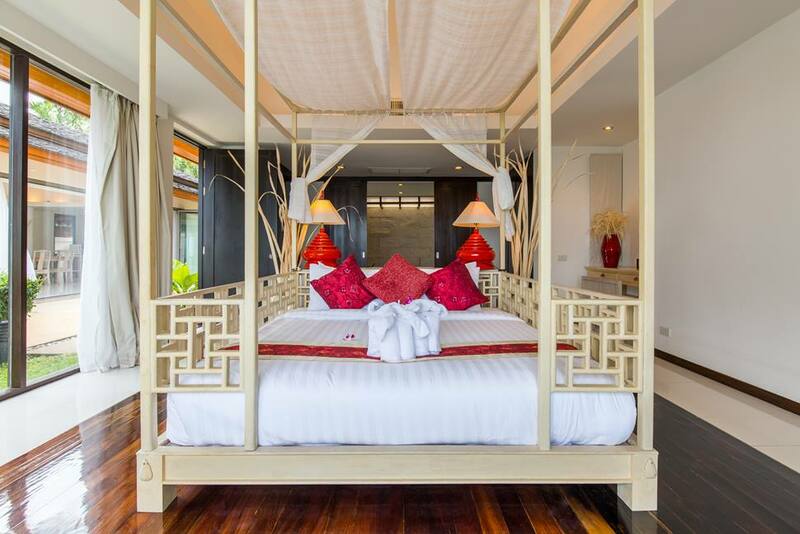 A four-poster bed with white draping sits in the centre of the room facing out across the pool to the ocean. 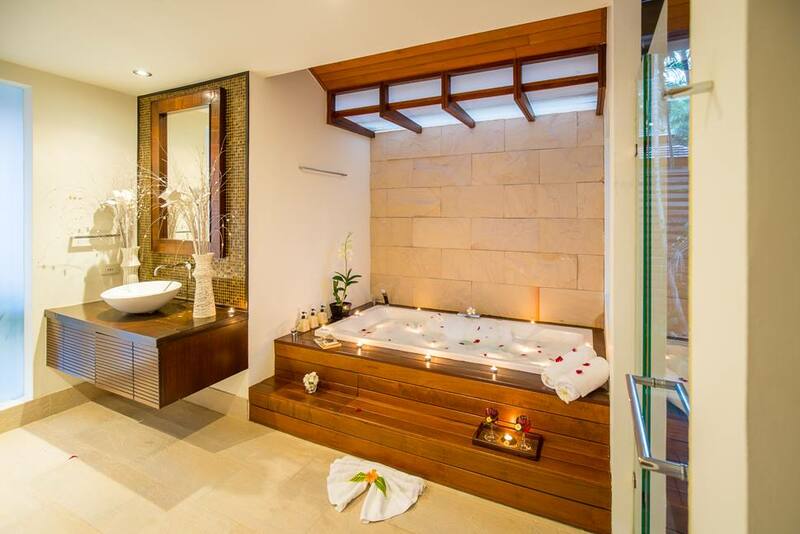 Behind the bed is a separate dressing area and sliding wooden doors open to reveal the indulgent master bathroom. 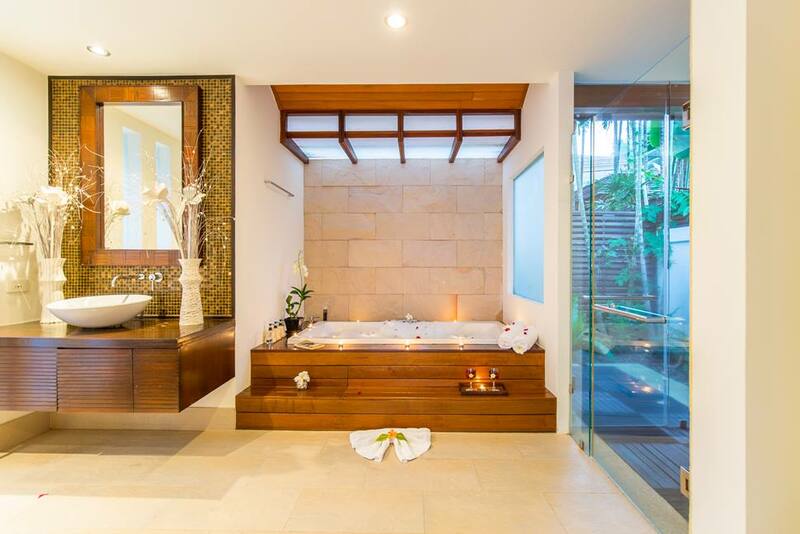 Steps lead up to a centrally placed sunken bathtub with a natural stone backdrop behind and a skylight above. 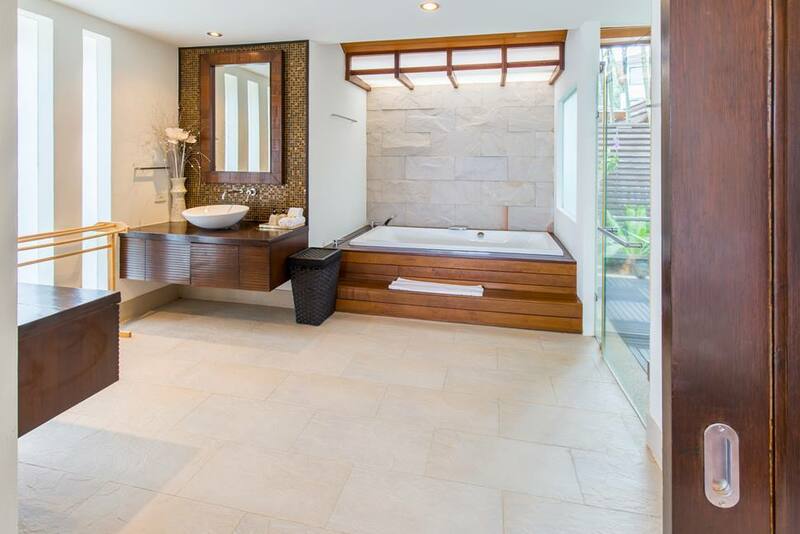 A recess to the left contains two separate sink and vanity units whilst on the right is a walk-in shower room which leads to an inner garden area. 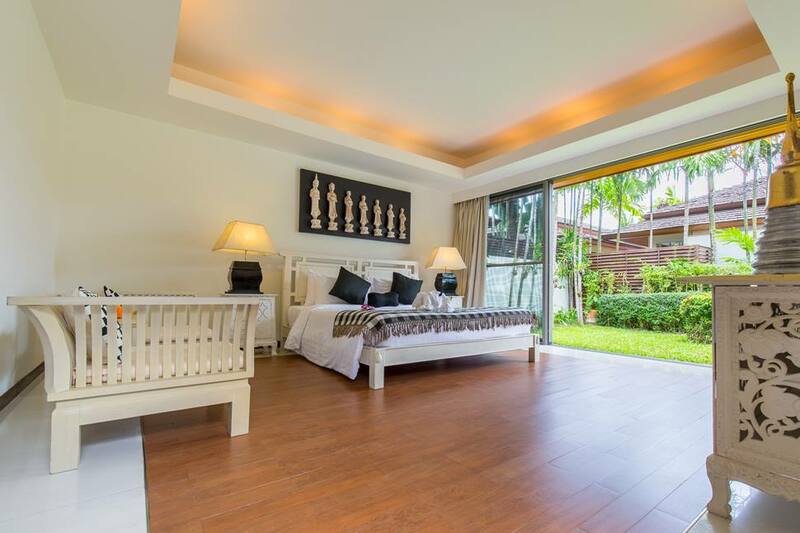 Yet another well maintained garden separates the master suite from the final bedroom pavilion. In here the theme is black and white. 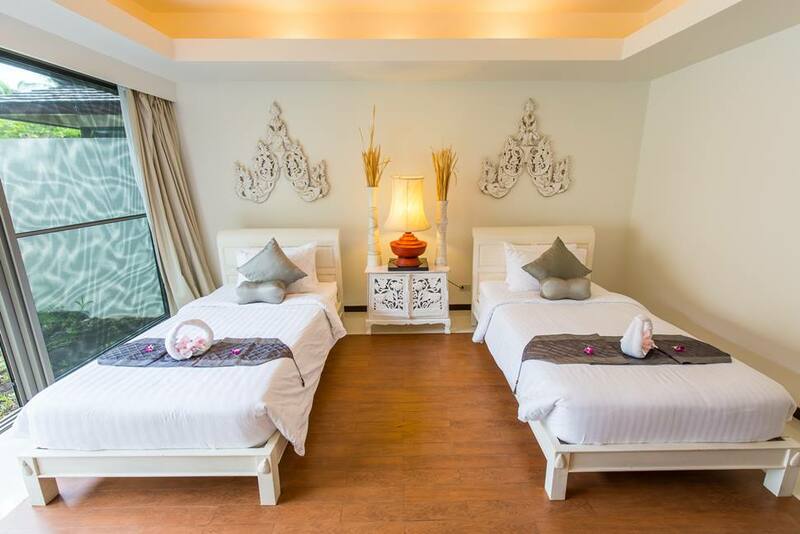 Again the white wooden furniture is of unquestionable quality and the bed is accessorized with a black and white checked throw. Above the bed are white stone monk figures mounted on a black background and the ornate white cabinets are each topped by a black lamp stand. There’s an en-suite shower room and dressing area and lovely views through the patio doors. Leaving this room brings back onto the central pathway, to the large parking area and back out onto the private road. 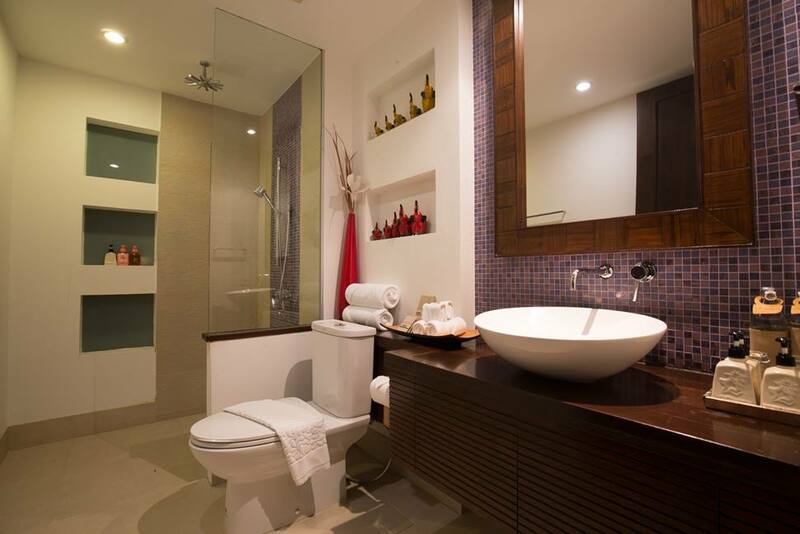 This property offers exceptional accommodation. 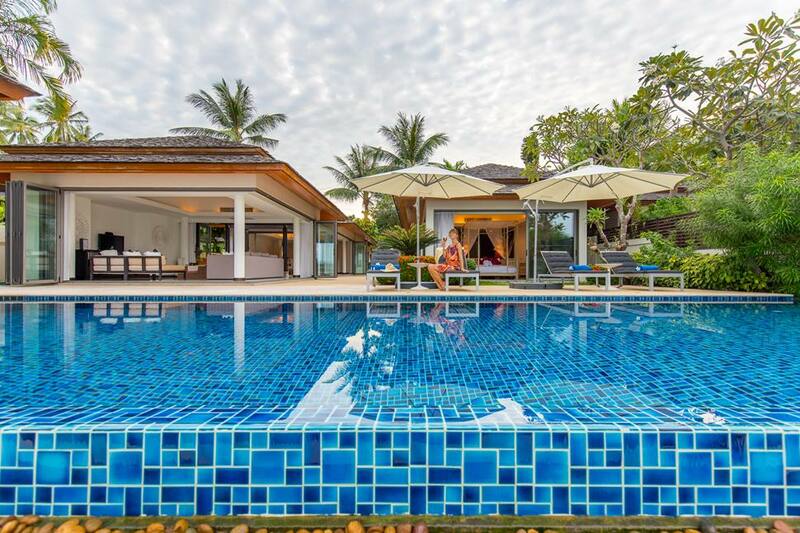 The size and layout of the overall property, as well as the individual pavilions, provides a villa which is perfect for friends or families to share and maintain their own privacy. 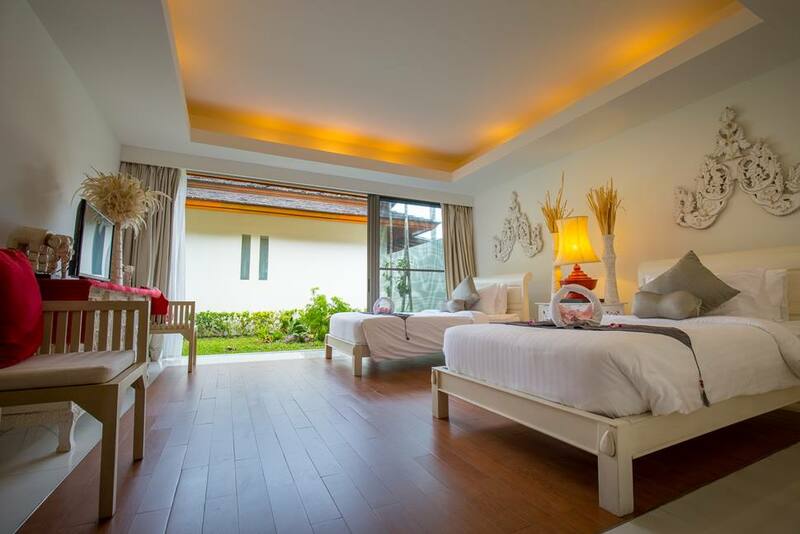 The style and décor is universally attractive and the choice of furnishings has resulted in a very comfortable, modern and chic villa to be enjoyed. 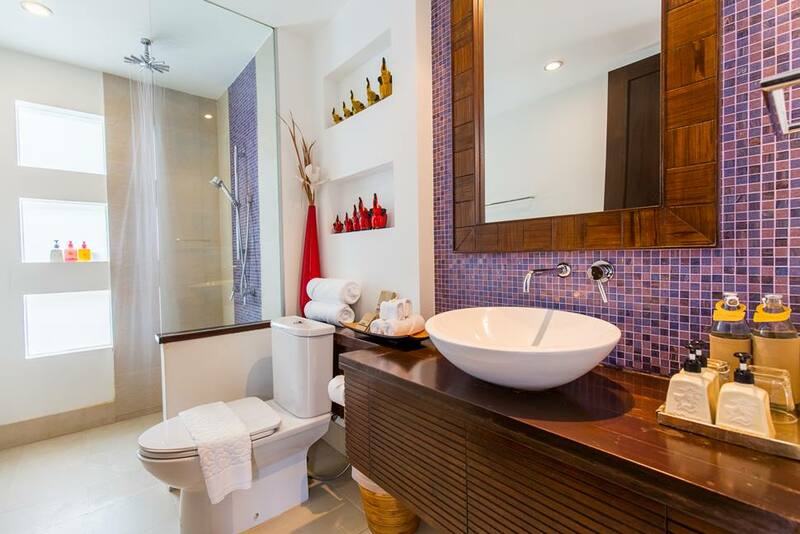 Daily rates from US$ 750 to US$ 1,750 depending on season.